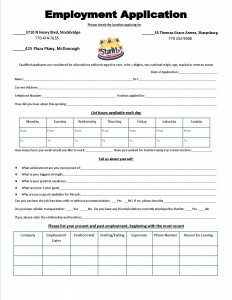 Join the Starlite Family Fun Center Team! Is A Fun Center Job Right For You? 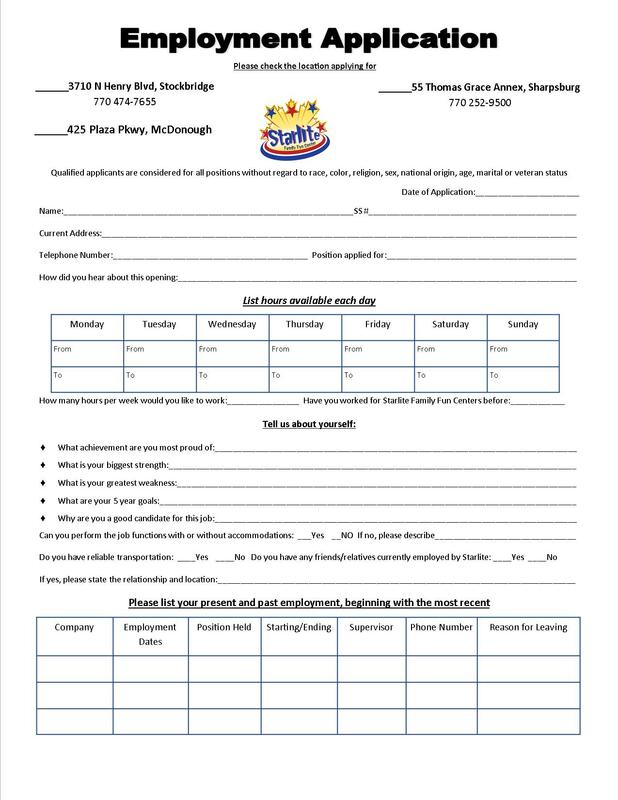 Below are a few of the requirements that you would be expected to meet if you are hired by the Starlite Family Fun Center. Honesty – Honesty is our number one requirement. It is our top priority on reference checks. Honesty in our business not only means accurate cash handling and proper use of tools and inventory controls, but also Doing What is Right. This also means that your friends and family do not receive food or services free, just as you would not expect free groceries from a friend who works in a grocery store. Friendly Attitude and Commitment to Excellence – Starlite Family Fun Center is dedicated to achieving excellence in family entertainment. We are committed to making each patron feel they are truly our GUEST by providing high quality entertainment, FRIENDLY CREWMEMBERS and OUTRAGEOUS SERVICE. Starlite seeks to employ individuals who are friendly and enjoy striving to become the best that they can be. If this sounds like you, we encourage you to apply! If you do not enjoy working with people, or you do not want to strive to be the best, then this is not the job for you. Schedule – We expect you to work the days you are scheduled and to be on time. Tardiness and absenteeism are not acceptable. Due to the nature of our business, you should expect to work some evenings, weekends, summer months and holiday periods. Appearance – All crewmembers are expected to wear the required uniform for the area assigned. No other dress is acceptable. Personal hygiene is very important because of the close contact with our guests. Female employees: No extreme hairstyles are acceptable. One earring per ear, one ring per hand, no extensively long or colored nails. Makeup should be limited and in natural colors. Male employees should have hair no longer than collar length with no tails. Necklaces are to be worn inside shirt and only one ring per hand allowed. No hair engraving. Drugs / Alcohol – The use of drugs or alcohol is not conducive to good crewmember or guest relations. For this reason, we administer random drug testing at our locations. 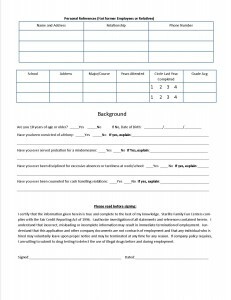 By signing this application you agree to participate in this program. For your safety and the safety of fellow crewmembers and our guests, we want to have a drug free work place and will do whatever we can to achieve this goal. If you have specific questions about the drug policy, ask the General Manager. Coming to the workplace under the influence of drugs or alcohol, or the use of drugs or alcohol in any manner while on duty is strictly forbidden and may result in immediate termination. This is not a complete listing of crewmember requirements at the Starlite Family Fun Center. All requirements will be reviewed with you in detail if you continue the application process. Compliance with all crewmember guidelines is a responsibility of employment. If you feel comfortable working under the conditions listed above, please continue with the employment application. As positions become available, applicants will be contacted for an interview. Not all applicants are granted an employment interview. Starlite Family Fun Center is an Equal Opportunity Employer. 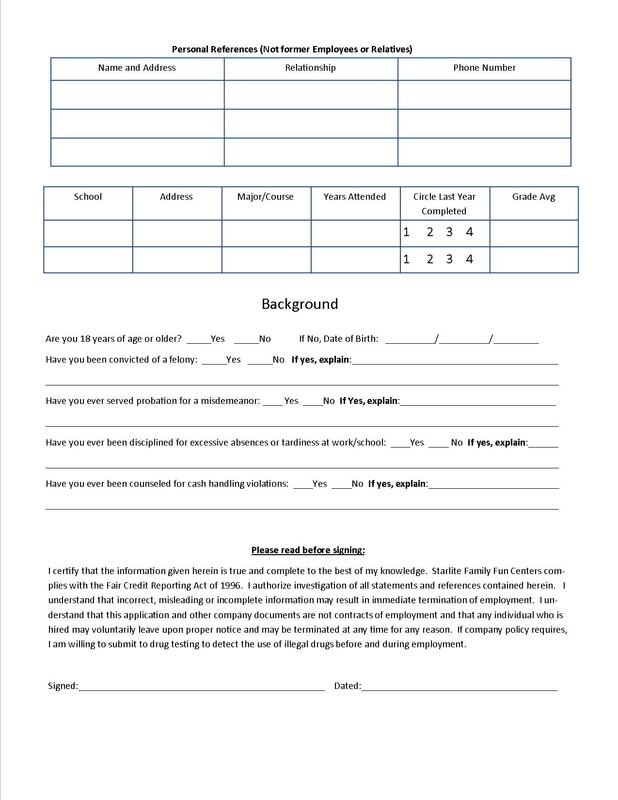 If you feel you are qualified to join our team, please download our documents and bring them to the rink in person. Please makes sure you print both pages.